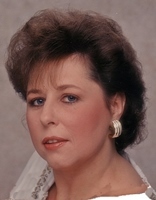 Kimmie Carpenter, aged 58, passed away on Friday, February 8, 2019. Kimmie had a kind heart with a gracious spirit who would do anything she could to help her family and friends. She was an excellent cook and enjoyed bowling. Kimmie loved animals, her dogs, and her horses when she was a kid. She worked for Yamaha for 24 years. Her mother, Cleo Fox; preceded her in death. Surviving are her husband, Kirt Carpenter; sons, Jeramy (Rachel) Fox, Eric Carpenter, Brandon Carpenter; sister, Danielle Phillips; brothers, Patrick, Bobbie, Shawn Burton; special nieces and nephew, Sarah, Amber, Jacob; and many other nieces and nephews. The family will greet visitors on Friday, February 15, 2019 from 12:30 to 2:30 pm at the Stroo Funeral Home; after which time we will proceed to Alaska Cemetery for committal services. Contributions in memory of Kimmie may be made to the ASPCA.